If you're having difficulty passing stools, you may be constipated. Although certain medications, a lack of exercise and other factors can play a role in constipation, you can often treat this condition through dietary changes. One such dietary change is drinking more liquids, such as fruit juice. The best options are those that are high in fiber and sorbitol. Prune juice is particularly beneficial for preventing or treating constipation because it is high in fiber. Each 8-ounce glass has 2.6 grams of fiber, or 10 percent of the daily value. Fiber can add bulk to your stool and soften it, making it easier to pass. A study published in the "Korean Journal of Community Nutrition" in June 2008 found that drinking prune juice and eating prunes helped increase fiber intake and the number of bowel movements while decreasing abdominal pain and defecation time and making the stool softer. 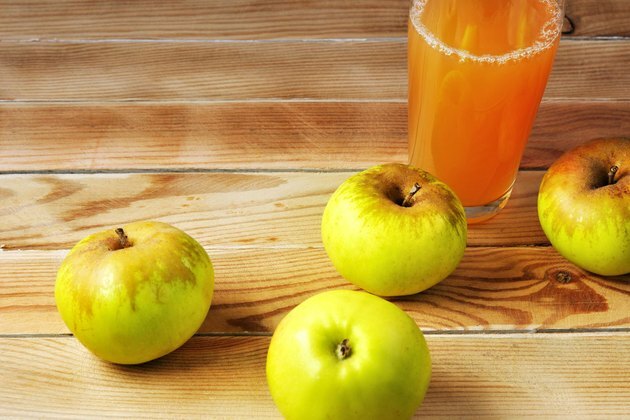 Apple and pear juice are also beneficial for constipation. These juices contain a type of sugar alcohol, called sorbitol, that isn't well digested, and this undigested sugar softens the stool by drawing water into the stool from the intestines, making it easier to pass. Other juices containing sorbitol include sweet cherry juice and peach juice. Don't worry if you're not a big fan of apple, pear or prune juice. Increasing liquids in general can help with constipation, so other fruit juices may also be beneficial. Try a glass of fruit juice or warm water with lemon each morning after you get up to help you have more regular bowel movements. Eat more fruits, vegetables, whole grains and legumes, as these are high-fiber foods that may help keep you from becoming constipated. Leaving the skins on fruits and vegetables, if they are edible, will help increase your fiber intake further. Avoid foods that may cause you to feel more constipated, such as cheese and eggs, as well as those that cause gas, such as carbonated beverages, broccoli and cabbage, to help limit constipation.